Toad in the Hole. - Fork and Good. 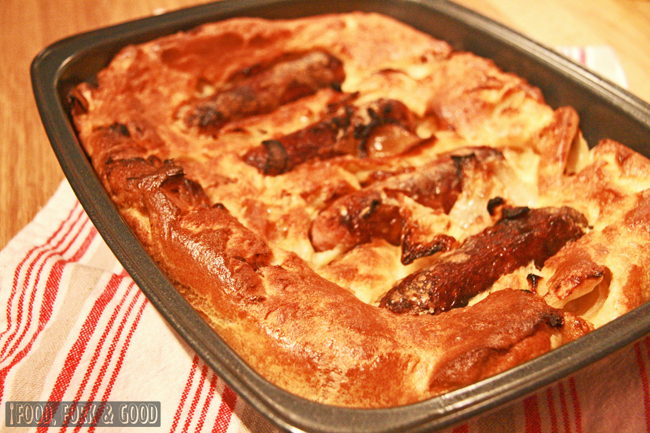 Home Dinner eat pudding recipe recipes Toad in the Hole. Ahh winter is among us. Waking up in the morning now requires more clothing than a trip to the arctic. First foot out of bed, then slippers, then dressing gown, then blanket, followed by a nice warm shower and cup of tea. Winter has wrapped itself around us, not that here in England you can really tell the difference. It just means we can put the heating on and enjoy the rain splattered view from beneath our many layers. It also means that when I wake up the morning, it's pitch black. Which is fun, because it still feels like night time, so trying to get my weary sleep drowned body into the day is like being ripped from the womb. But there are SO many awesome sides to winter. The cosy nights in, wrapped in blankets, with a steaming hot cup of something yummy, the excuse to go out and buy more scarves (is that just me? ), the countdown to Christmas, waiting for the first snow (or sleet, whatever comes first), and the extreme preparation going outside takes. Best of all? Winter foods. Oh come on! You all know what I mean. Stews that you leave simmering all day. Everything flavoured with pumpkins, the biscuit trays start coming out, hot sausages and nuts, everything smothered with gravy, thick winter veg soups, yummy roasts and the good old fashioned slow cooker comes out of retirement. Yes, it's that time of year where we traditionally pile on a few pounds...yah know for warmth and all. But it really doesn't have to be that way. These next few weeks, I'll be posting up some winter warming classics that won't leave you feeling fatter than the Christmas Turkey. But you guys know me. I'm not going to be posting winter salads either. As a show of good faith, I'm starting off with a classic. 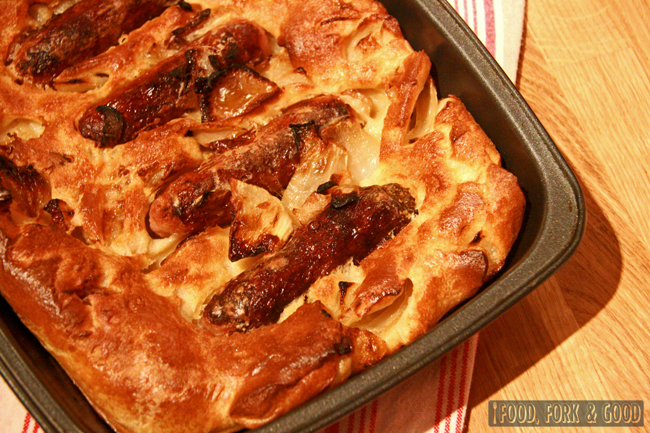 Toad in the hole. I use full fat sausages, and I make no changes to the good old fashioned batter, so how is this not going to make you balloon?! Very simple. I bulk it out with sweet onion, and typically serve it with a big side of roasted Winter veggies. You can simply reduce the oil, and maybe take away a sausage or two. This portion serves up to four people, and as long as you make sure you fill that plate with some tasty greens too, you won't be going hungry. Yorkshire pud's have a bit of a rep when it comes to not working out as planned. The first few times I made them myself, they came out as pancakes, or worse - like an actual cake (That was the time I tried using baking powder in it. Oops!) But when it comes down to it, it's pretty simple. 1. Add an extra egg white in there to get some height! 2. Don’t open the oven whilst it’s cooking. 3. Make sure you whisk it well, combining the liquid bit by bit. 4. Leave it to stand for a minimum of 15 minutes once mixed. 5. Make sure the pan & oil are really hot when you pour in the batter! 6. Some say using vegetable oil instead of olive helps. 7. Place them in the middle of the oven (remove the top rack) to give them ample rising space. Ahhh yum! 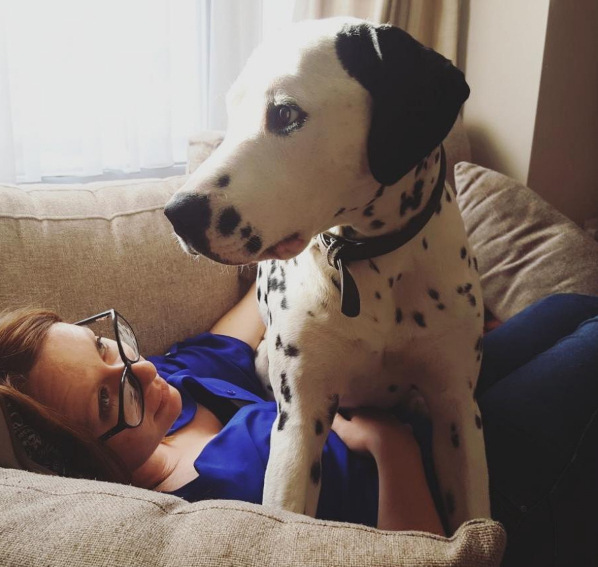 Of course, I can offer a few tips to make it even slimmer. Use skinless sausages, or thin sausages instead of the big thick full fat ones & use semi skimmed milk instead of full fat. 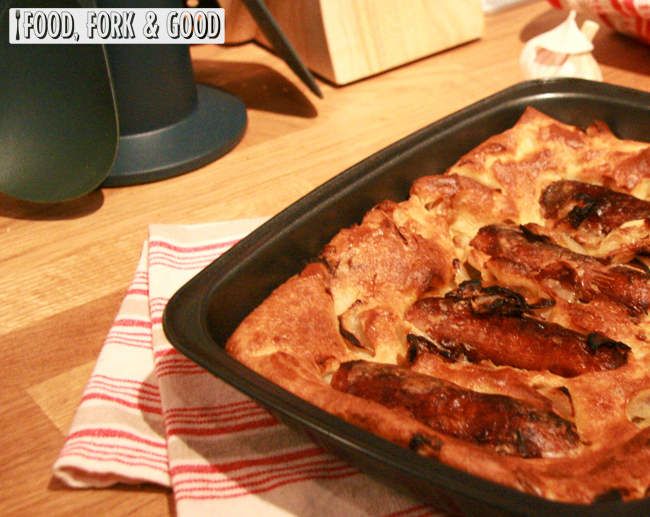 I loooove toad in the hole! (though I use veggie sausages of course :) ) Your Yorkshires look great! This looks delicious. 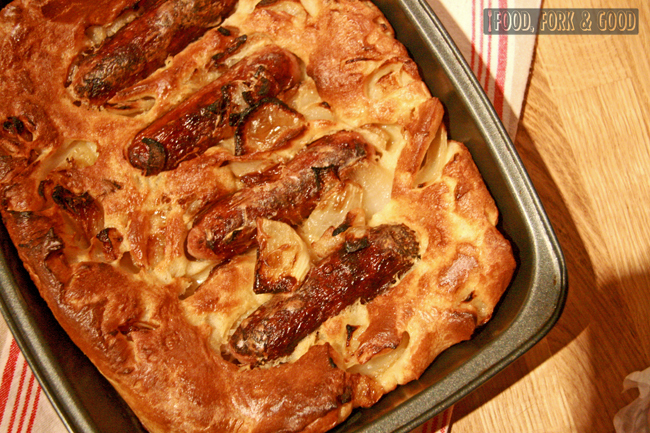 I love the name toad in the hole sounds great. I also love the winter foods. I hope your week is going well. I have never had this, but it sure looks like something I will be craving much on cold days once I try it. It's worth it! Very tasty stuff! And definitely something to warm you in winter! I am totally making this for tea tonight! I think I'll add an apple to it too, see how that goes. No way girl this looks so great!!!!!! This looks totally comforting and mouthwatering! Oh my comfort food deliciousness! These looks amazing! 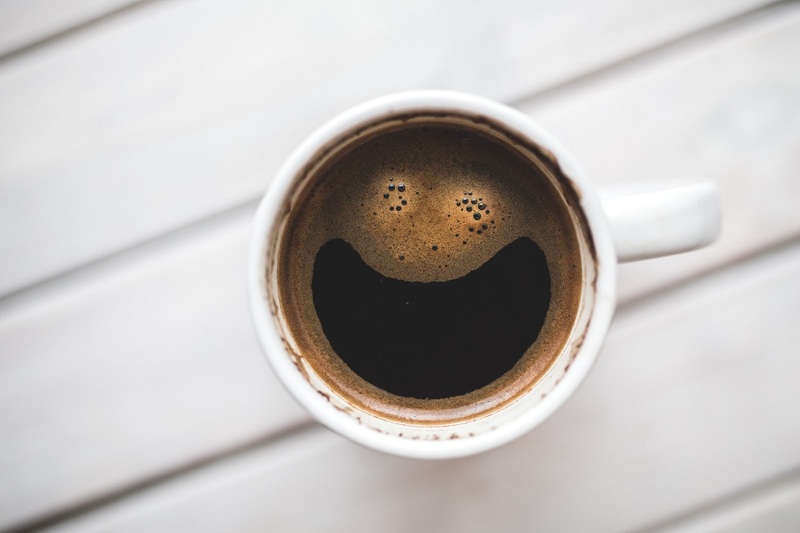 Have a fantastic week! I'm with you in loving the comfort foods of winter. This is a perfect recipe to make for the ponytails because it combines two of their favourite things. I'll let them know this meal with the cute name is from my blogging mate in England. Keep em coming!